Our team of photographers took over 3,000 photos throughout the race, but at the starting line itself came our only shot of of the seemingly unseaworthy Kinetic Couch. However, the couch is built of styrofoam and wood, the lamps are oars, and a mini-keg under the front helps keep everything afloat. 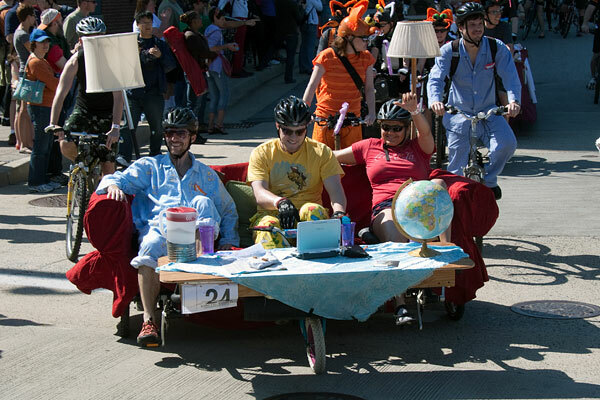 The pajama-clad couch surfers were ready to tackle the race until an axle breakage a couple miles from the starting line won them the Golden Dinosaur award, created by the same Dr. Laurence J. Peter who created the Peter Principle.